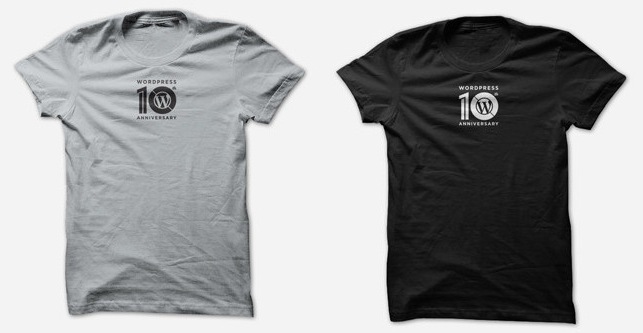 In honor of the upcoming 10th anniversary celebrations, we’ve put a special 10th anniversary tshirt in the swag store at cost — $10 per shirt plus shipping. They’ll be on sale at this price until the anniversary on May 27, and they’ll start shipping out the week of April 29. Some people who are planning parties or who organize meetups are already talking about doing group orders to save on shipping costs, which is a great idea — just make sure you allow enough shipping time. If you’re not sure if the tees could make it to you in time on your side of the world, use the contact options at the bottom of the store page to ask about shipping times. If they can’t reach you in time and you want to have a local printer do some for your group, we’ll post the vector file on the wp10 site within the next week (and this post will get updated accordingly). The shirts are available in black or silvery gray. Why silvery gray? Because of trivia: the traditional gift for 10th anniversaries is tin or aluminum.